So what did y'all do on Memorial Day weekend? This year I didn't sit around the house waiting for a late invite to a barbecue or be bored out of my mind watching the Indy 500. I accepted the invitation of Alice Serna-McDougald, Chris Valdez and United We Dream to join them and Latinx people from five states (AZ, NM, FL, NY and MD) plus Washington DC in Austin to protest SB 4. At approximately 10:30 AM chants of 'SB 4 is hate! 'Hey hey ho ho, SB 4 has got to go' , 'Here to stay!' and 'This is what democracy looks like' erupted in the House gallery along with banners being unfurled stating 'See you in court' and 'SB 4 is hate' as simultaneous chanting from the assembled masses on all four floors of the Capital rotunda occurred at the same time. 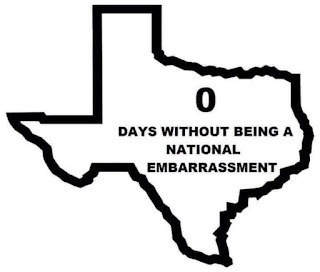 It was fun watching the shocked, embarrassed and bewildered looks on the faces of the GOP legislators on the House floor who probably thought they were going to escape Austin and head back home without being held accountable for passing that racist law. Um no, GOP boo boo kitties. Y'all were not escaping facing the consequences for your racist act on behalf of your party. I hope they have the same bewildered looks on their faces after the November 6, 2018 election. Many of the legislators since it was sine die day, had their families with them and probably had to lie to their kids about why they passed the unjust and racist SB 4. 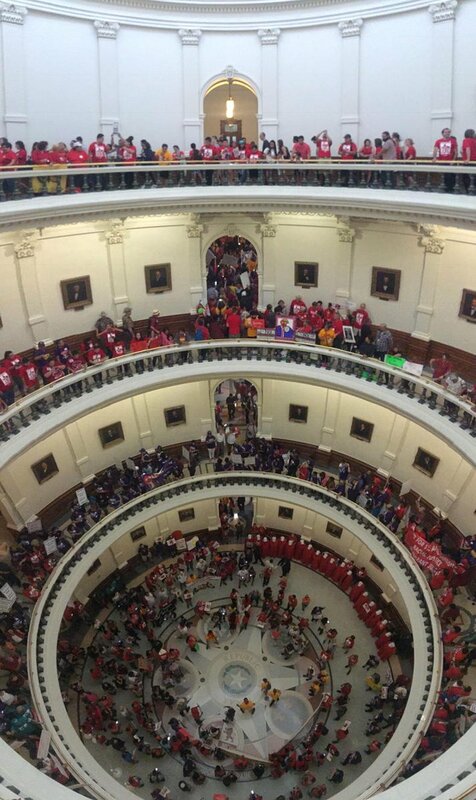 Pro tip to the Texas GOP: If you don't want to face protests in the Texas capitol, them stop passing unjust and racist laws that will piss people off . The Texas House leadership reacted by ordering the House gallery cleared as the chanting continued while being herded out of the chamber by DPS state troopers. Once the gallery was cleared, Texas state Rep. Matt Rinaldi (R-Irving) let his inner bigot out by threatening to shoot a fellow Latinx legislator and telling a group of Latino legislators watching the demonstration from the House floor that he'd called ICE on the protestors. Um GOP dude. your pointed hood is showing. Many of the protestors in that House gallery are American citizens. You also proved a point I repeatedly make that the most dangerous bigots are the ones who have legislative power. It's also a bad political move in a city that is 40% Latinx, and you barely won election to your Texas house seat in 2016 anyway. I also received the honor of getting to make a little speech before the thousands of huddled masses yearning to breathe free from Texas GOP tyranny at the rally on the south steps of the Texas Capitol. . Yes ma'am we will, if we work together across the Lone Star State to do so and bumrush the polls on November 6, 2018 to flush the TX GOP out of power. It's is mercifully Day 140 of the 85th Texas Legislative session and the last day of it. The clock is ticking toward 12:01 PM as we stand on guard in liberal progressive Texas for any GOP led legislative attacks on our human rights and our humanity. It has definitely not been an easy session for those of us who fight for the human rights of TBLGQ Texans. The last time we had anti-LGBTQ bills passed in Texas was 2005, and we'd just come off a 2015 session in which we were successful in killing 24 anti-TBLGQ bills including four anti-trans ones. The anti-LGBTQ Forces of Intolerance were determined this year to pass some anti-TBLGQ hate legislation this year and we were just as determined to kill them. There is chatter that we may be going into a special session, but right now, just need this one to end with the quickness. 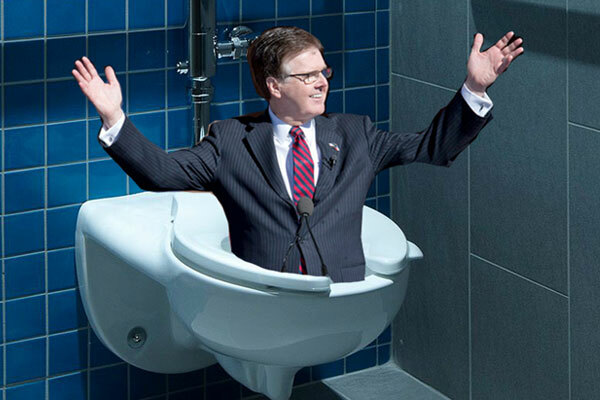 And if Governor Abbott is stupid enough to do Dan Patrick's bidding and call it, me and the trans community will be there ti be in his face again to flush any anti-trans bill they propose. Did the conservative white males in Pearland not get the message that Islamophobia is not okay at any time, especially when deployed during a campaign? 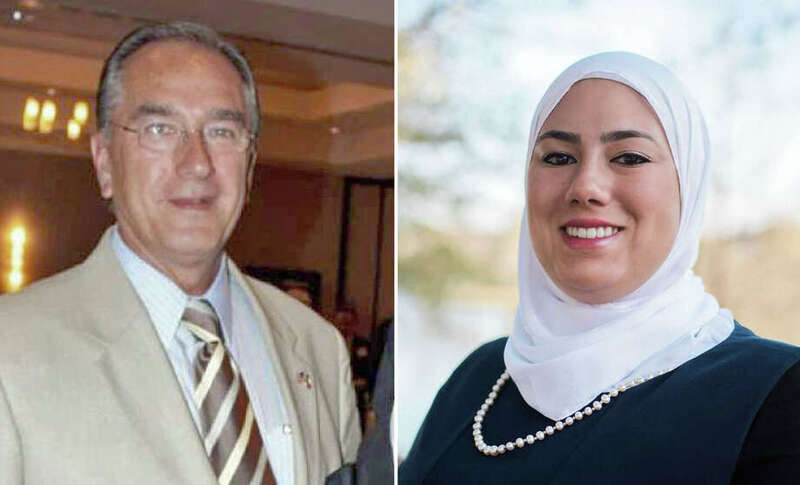 Islamophobic comments made by the incumbent aimed at Dalia Kasseb probably played a role in Mike Floyd comfortably winning his Pearland ISD school race, and now we may have a replay happening in the runup to the June 10 Pearland mayoral and city council runoffs. She noted in a Houston Chronicle story that when they have met in person, he seemed cordial, but Owens' has been sharing anti- Muslim message and comments on his Facebook page,. "Our few meetings have been very pleasant,"Kasseb said. "But for him to be sharing that stuff on Facebook shows what he really believes." The controversy also has had an indirect impact on the Pearland mayor's race. Longtime Pearland Mayor Tom Reid is being challenged by 36 year old Quentin Wiltz, The 91 year old Reid has held the mayor's chair for a combined 34 years (1978-90, 1995-present), and publicly endorsed Owens on who served four terms on Pearland's city council, back on April 6. But Reid has been silent since the story broke about the Islamophobic comments that Owens has been sharing on his Facebook page since February 2015. 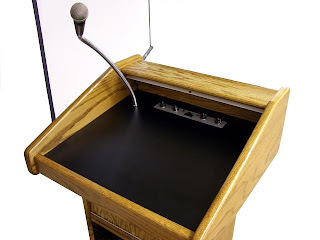 If Reid doesn't share those opinions, then he may want to open his mouth and say so before June 10 because early voting for the mayoral runoff election begins on May 30, and Wiltz garnered 45% of the vote back on May 6. Pearland is a fast growing southern suburb of Houston that has grown from a small town of less than 5,000 residents in the 1960's to over 130,000 people, and its population has tripled and gotten more diverse since 2000. It is currently 47% Anglo, 25% Latinx, 17% African American and 9% Asian . But it seems as though some peeps either aren't aware of that or are being willfully ignorant about that fact, and the clock is ticking toward the June 10 conclusion of this runoff campaign. Well, looks like I'm going to be making another trip to Austin in a few hours. I was asked to be a speaker at this Memorial Day event to loudly proclaim to the world that we are not down with the actions our oppressive Texas Republican controlled government took in passing the unjust SB 4. Since 2009, the combined non-white population of Texas outnumbers white people, which is probably why the Texas RepubliKKKans were hellbent on passing this unjust and racist legislation. 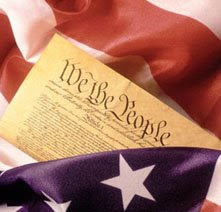 They are failing to heed the lessons from the previous times Republican controlled state legislatures passed unjust anti-immigration laws like California's Prop 187 and Arizona's SB 1070. In California, it incensed and galvanized the state's Latinx population to get involved politically, and that mobilized Latinx population helped flip the state blue in less than a decade. And FYI Texas Republicans, California, like Texas is another state in which brown folks outnumber white ones. Looking forward to spending Memorial Day with my Latinx siblings and expressing my disgust about SB 4. With the potential of an anti-trans special session increasing, Texas based companies that opposed SB 6 and HB 2899 are starting to speak up, with IBM being the first to release a statement opposing the passage of any discriminatory laws. “IBM has a longstanding commitment against discrimination in any form and believes that an inclusive and welcoming environment is the best way to attract talented individuals to our company. Thank you IBM. Any other Texas based company wish to speak out in opposition to a special session specifically for the purpose of passing an unjust law?. 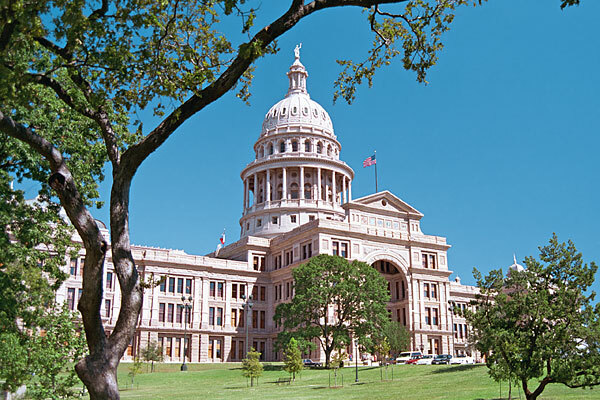 The 85th Texas Legislative session is mercifully drawing to its sine die day close, but Lt. Governor Dan 'Potty Polizei' Patrick wants a special session to oppress trans people. Last time I checked the Texas Constitution, only the governor had the power to call a special session, not you. 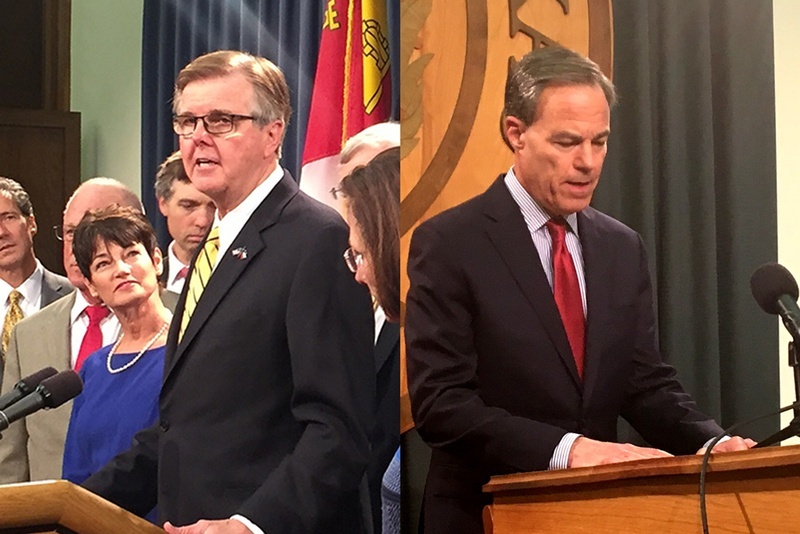 On Friday Speaker of the House Joe Straus, who made it clear at the beginning of the session that he nor the House is interested in his pet project SB6 bill to oppress trans people, called a rare press conference to announce that the House would waste no more time on his bathroom obsession. 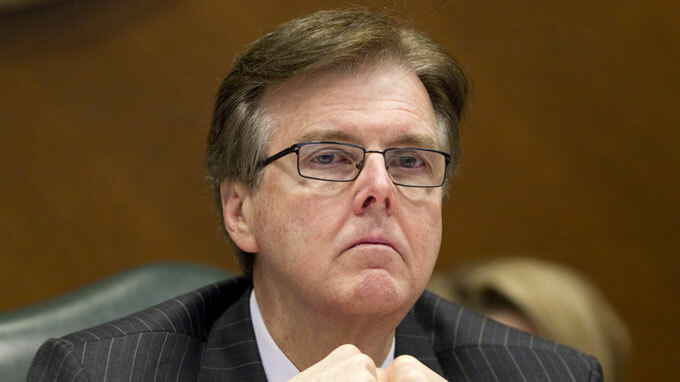 Yes, it is absurd that Dan Patrick has been pushing this issues even that thousands of Texans, the business community and others have said we don't want North Carolina style HB 2 idiocy with a GOP Texas twang in our state oppressing our trans kids and trans Texans. We thought we'd sent that message loud and clear with us showing up en masse at the Pink Dome back in March and April in opposition for the SB 6 and HB 2899 hearings, but yet Dan Patrick and his Texas GOP lackeys still want to mess with Texas trans people. Maybe we need to send it again by calling and contacting the governor's office and urging him to resist following Dan Patrick's delusional lead and not waste our time and tax dollars by calling a special session. Sherrell Faulkner was attacked and found suffering from trauma near a dumpster on November 30, 2016 in the gay friendly Plaza-Midwood neighborhood in northeast Charlotte, NC. She succumbed to her injuries on May 16. 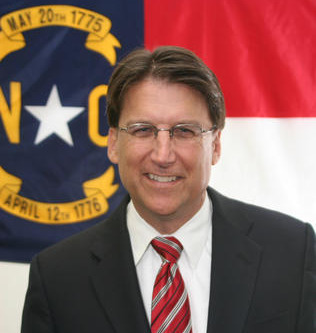 The attack we must point took place after a contentious North Carolina gubernatorial election in which transphobia was served up by the North Carolina Republican Party and its incumbent governor Pat McCrory that he subsequently lost. The 46 year old Faulkner is now the 11th trans woman in the US we have lost to anti-trans violence. All eleven of them have been women of color, with now ten of them being African American. Rest in power and peace, Sherrell. We will say your name because your life mattered, and we won't rest until the people who took you from us are brought to justice. We are rapidly heading toward the halfway point of 2017 and this has already been a trying year for many of us, especially in Texas. Memorial Day is Monday, and in addition to serving as a day in which we remember all the people who died while serving in the US armed forces, the long weekend off for this federal holiday serves as the unofficial kickoff to the summer season. So let's get right to our Friday Shut Up Fool Awards business and announce who this week's fool is. But according to y'all, it's not about discriminating against the Texas LGBTQ community and Texas transgender people. Sell them woof tickets and lies to your base. We ain't buying that transphobic and homophobic nonsense. You're also the reason why we haven't had nice things in the Lone Star State since this woman left the governor's mansion in 1994. And yeah, #Y'allMeansAll, and we TBLGQ Texans vote. See y'all at the polls on November 6, 2018. And oh yeah, Texas GOP, Shut up fools! 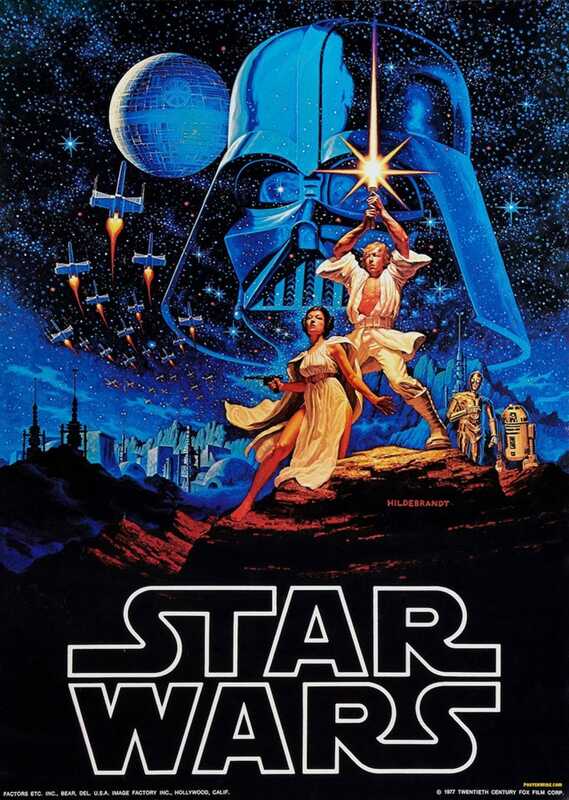 40 years ago in a galaxy called the Milky Way on a planet named Earth, a film debuted on this date that has become a iconic classic, sparked a revival in the science fiction genre and spawned a media empire that is now owned by Disney. On May 25, 1977, Star Wars debuted to the delight of science fiction nerds like myself. We flocked to our local multiplex theaters in droves to see the space saga and fictional galaxy in which good as repped by the Rebellion and a Luke Skywalker trained in The Force triumphed in this movie over the evil Galactic Empire run by Emperor Palpatine and his Sith apprentice and enforcer Darth Vader. >The inaugural Star Wars movie raked in over $450 million in the US alone and another $775 million worldwide and has significantly impacted pop culture and even politics as Reagan's embrace of the term 'evil empire' to describe the then Soviet Union aptly is an example of. Star Wars also borrows from politics and history. The Galactic Empire's stormtroopers share the name from the Nazi stormtroopers. The Empire's black political officer, commander and guards uniforms are modeled on the Waffen SS, and the Imperial fleet uniforms borrow elements from the World War II era German Wehrmacht. 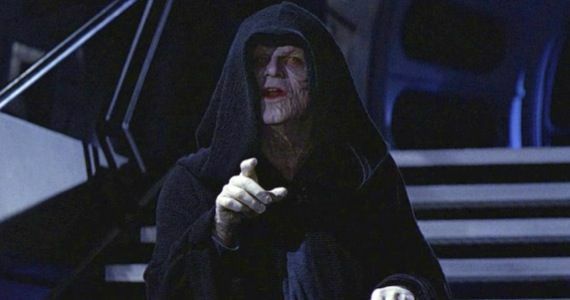 Palpatine's rise to power is is similar to how Hitler came to power in 1930's Germany. Palapine was first elected chancellor of the Galactic Republic before seizing power to become dictator and declaring himself emperor. then subsequently having the Jedi Order exterminated. . 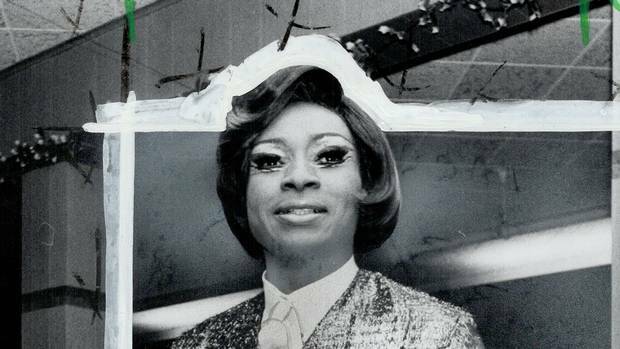 I've talked about in these TransGriot electronic pages about trans masculine gospel singer Wilmer Broadnax, who was a major star from the 40's to the 70's. 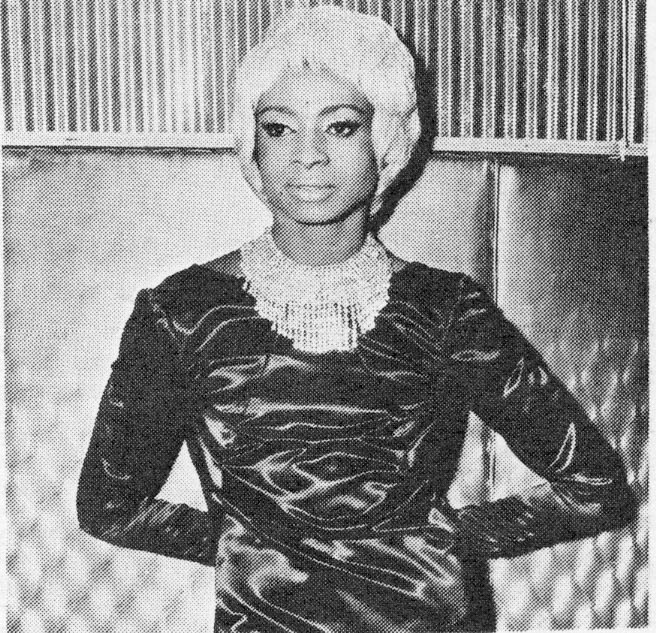 Now it turns out that we are now getting another piece of our Black trans history revealed in the person of R&B singer Jackie Shane. She was born in Nashville on May 15, 1940. While Nashville is world renowned for its country music scene, it also had a thriving blues and R&B music scene centered on the clubs on Jefferson St.
Shane was surrounded by music from an early age, and according to the 2010 CBC Elaine Banks radio documentary I Got Mine; The Story Of Jackie Shane, as a teen she stayed with Marion James, Nashville's legendary Queen of the Blues. She moved to Montreal in 1960, and a chance 1962 encounter with the Washington DC based band Frank Motley and the Motley Crew, known as Frank Motley and the Hitchhikers north of the border led to her becoming the lead singer for the group, relocating to Toronto with them in 1961 and as their lead singer subsequently taking Toronto's music scene by storm. Shane and the band would occasionally head south for US gigs in Boston, Nashville and Los Angeles, but it was Toronto where they were making their money. Toronto's music scene was centered on Yonge Street, and they were tapping into the hunger Canadian audiences had for R&B and soul music. 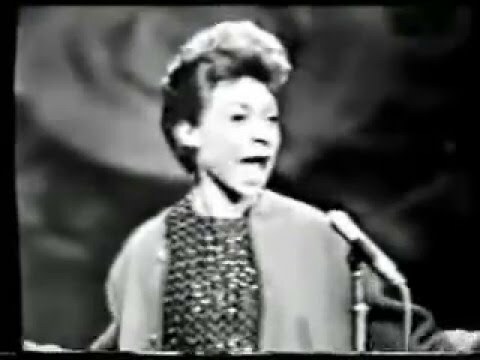 Shane's first single was a cover of the Frank Barrett Motown classic song Money, but it was the song she released later in 1962 entitled Any Other Way, that hit number two on the then influential CHUM radio music chart that led to her taking the Toronto based music scene by storm . As the 60's inexorably moved into the 70's the bookings dried up and Shane left Toronto in 1971 returned to the States and lost touch with her bandmates. She turned down an offer from George Clinton to become part of Funkadelic and began caring for an aunt in Los Angeles. She returned to Nashville around 1996 after the death of her mother as people wondered what happened to her. Rumors abounded that she had been violently murdered in LA or committed suicide until she was found by saxophonist Steve Kennedy living in Nashville in 2005. 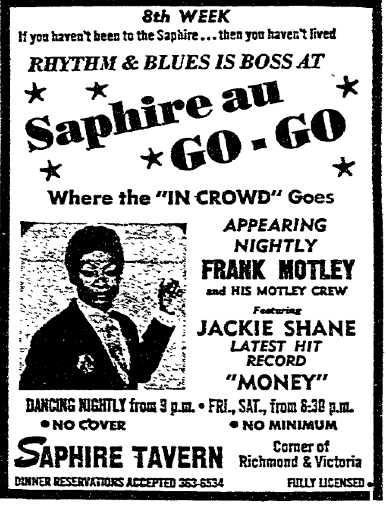 Thanks to that 2010 CBC radio documentary, there has been renewed interest in Jackie Shane's career and life, and she's still alive and kicking in Nashville at age 77. And yes, Jackie, your life means plenty to all of us trans peeps all these years later as a Black trans woman living her life. doing what she loved and being unapologetic about it. 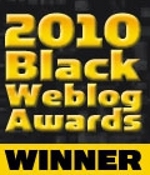 It also means that another piece of our Black trans history has been uncovered for us to enjoy and appreciate. 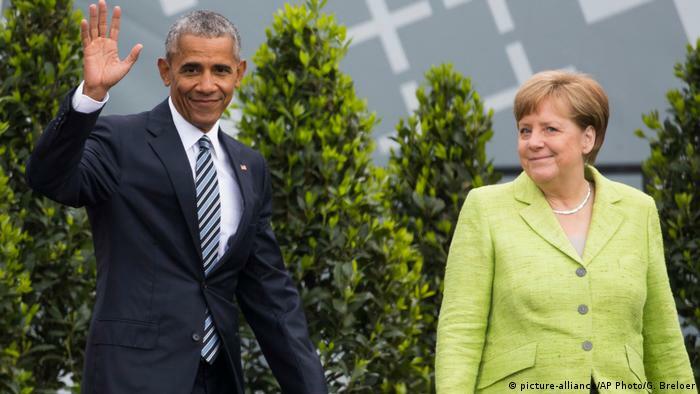 President Obama journeyed to Berlin at the invitation of German Chancellor Angela Merkel, the leader of the free world, for the Kirchentag, the German Protestant Church Congress. This one was taking place not only during the 500th anniversary of the Reformation, but with a looming German federal election in September that you know the Russians are just itching to mess with. The invitation to speak came last year, so it's a coincidence that the former POTUS is here in Europe as the same time as 45 is on his problematic first international trip in which he's Making America Look Bad Again..
And President Obama is still very popular in Germany. He visited Germany six times, with the initial trip happening during his 2008 campaign in which 200,000 Germans gathered to hear him speak in front of Berlin's Siegessaule (Victory Column). At this point we all know what happened on May 21, 2017 in what will forever known in Texas history as Discrimination Sunday. The Texas House and Senate Republican majorities rammed through the unjust SB 2078 and HB 3859 to satisfy their oppressor genes and to satisfy their right wing pastors and base. As the Rev. Dr Martin Luther King, Jr stated, "We must accept finite disappointment, but we must never lose infinite hope." Yes, this was a loss, but it was only one battle in the long road we are traveling towards trans liberation and ultimate victory in World War T. The world is increasingly coming to the realization that trans rights are international human rights, but as usual, the conservative movement is on the wrong side of history. 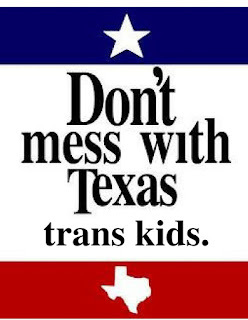 Texas trans kids, know that this fight isn't over. 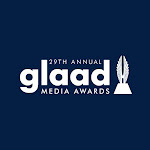 I, your parents, your trans elders, our allies and all who love you will continue to fight to ensure that you have better quality lives than we did growing up, I have the infinite hope that we will in my remaining lifetime on this space rock emerge victorious and see Texas stop attacking your humanity and instead embrace it as we do. I have the infinite hope this will happen because I see the determination in your and your parents eyes to make this a reality, and it inspires me to keep fighting. Texas is your state, too. It, the state seal, the Texas flag and our state capitol building in Austin are not the wholly owned subsidiaries of the Texas Republican Party. This diverse multicultural state will be blue again, and once that happens we will once again see common sense legislation coming from under the Pink Dome. But we have a lot of work to do to get it to that point, and Discrimination Sunday made it clear what we must do starting today and in every election cycle at all levels of government in our state from now on is #FireTheTexasGOP. If it takes some of us running for office to flush transphobia from Texas government, then that what's going to and must happen. They messed with you, Texas trans kids. It's time for them to pay a political price for that, the same one that Debbie Riddle and Gilbert Pena did for sponsoring anti-trans legislation in the 2015 session. Know beyond a shadow of a doubt Texas trans kids, you are loved, you are worth fighting for, and we will not rest until the Lone Star State realizes that the humanity and human rights of trans people are not a political wedge issue. One of the things I was deeply concerned about when the North Carolina GOP started messing with trans people and passed the unjust HB 2 law was that the ramped up anti-trans rhetoric the North Carolina GOP used to satisfy their trans oppressor gene would result in trans folks in the Tarheel State being targeted for violence or worse. I feared that the folks who would feel the brunt of the ramped up anti-trans violence would be the North Carolina trans communities of color because anti-trans hate thoughts + anti-trans hate speech = anti-trans violence/ murders. Well, that fear became a reality on November 30, 2016 for 46 year old Sherrell Faulkner. She was found near a dumpster in Charlotte's gay friendly Plaza-Midwood neighborhood at The Plaza and 35th Street suffering from trauma and was taken to Carolinas Medical Center for treatment. She died on May 16 from the injuries sustained in the attack, and became the 11th person in 2017 and 10th African-American trans woman to die this year because of anti-trans violence. And in a far too common and infuriating media pattern, another Black trans murder victim has been misgendered once again. This time the guilty party is WCNC-TV. Faulkner's death is also on the hands of the North Carolina Republican Party and former Gov. Pat McCrory (R), who with their loud and wrong anti-trans rhetoric incited the violence that led to the attack on Faulkner in the first place. 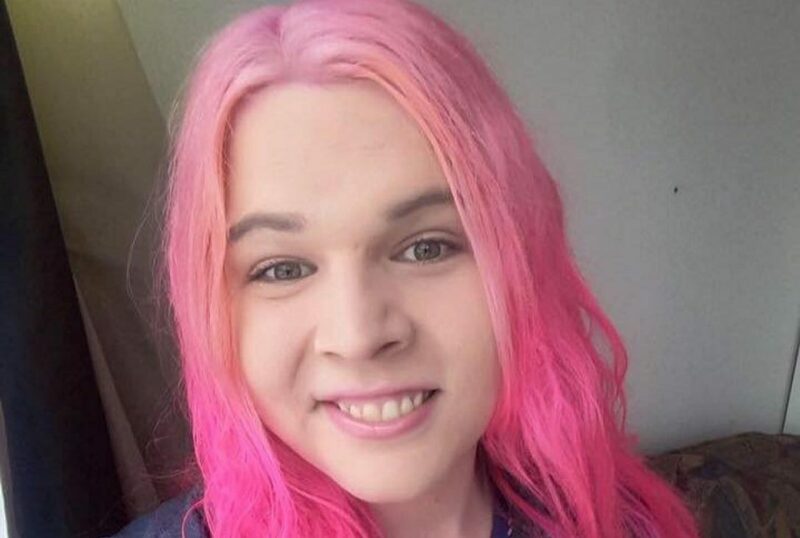 Her family has been notified of her death, and no word as of yet from my North Carolina trans family and media peeps if there is a memorial service planned for her. Charlotte Mecklenburg Police are now investigating this case as a homicide. And as always, will be keeping track of this case until justice is served. Rest in power and peace Sherrell. 18 year old Mike Floyd is having the Senior Week to beat all Senior Weeks. While his fellow Glenda Dawson High School classmates are looking forward to Senior Week activities and heading to NRG Stadium for their looming graduation on Friday, the UH bound Floyd will be getting inaugurated as the newest and youngest member of the Pearland ISD school board later today. The 18 year old Floyd pulled off the upset by knocking off two time PISD school board incumbent Rusty DeBorde, who had the endorsement of US 22nd District Congressman Pete Olson (R-Sugar Land ). DeBorde also committed an unforced error during the campaign by sharing an Islamophobic article on his Facebook page from former Pearland City Councilmember Kevin Cole that caused a major online backlash in the Pearland area on the eve of the election. Even though the Islamophobic post didn't name her, it was obviously aimed at Pearland City Council candidate Dalia Kasseb, who is the first ever Muslim candidate in Brazoria County history and is currently in a runoff for a city council seat against Woody Owens. Floyd ran in large part because he was angered by the shameful treatment of trans kid and Pearland ISD student Kai Shappley and the transphobic remarks of Pearland ISD superintendent Dr. James Kelly. Floyd wasn't your average 18 year old either. He has been involved in politics for most of his young life before he ran for the PISD board, so he earned this win. "Across the board, people are fed up. They are not going to allow this narrow mindset,"said Shappley. It also isn't hurting that Pearland area millennials are speaking up and in Mike Floyd's case, successfully running for office. The result of the winds of change blowing through Pearland is the historic event that will take place at 5 PM later today as Mike Floyd is sworn in as a PISD board trustee. It may also be a sign that supporting trans people is an enhancement, not a detriment to your electoral chances in the Lone Star State. 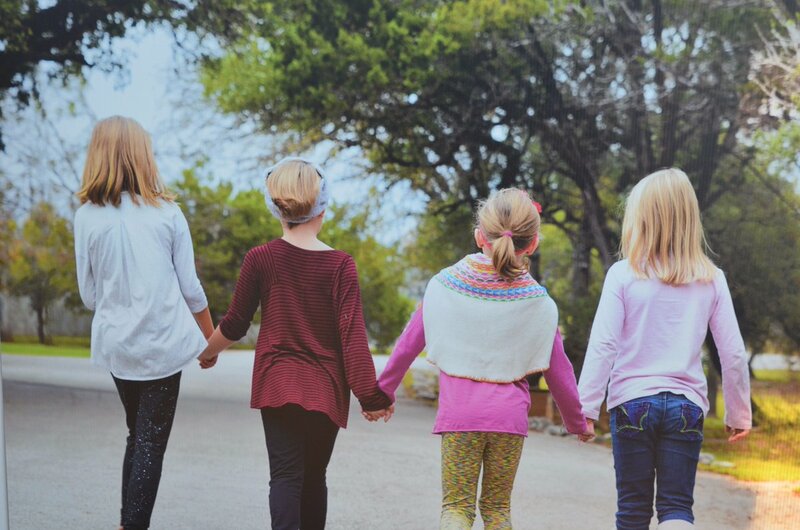 Pissed off because their big unjust anti-trans discriminatory bills in SB 6 and HB 2899 were bottled up and died in committee, the Texas GOP majority on Sunday, facing a looming threat of a special session, decided to switch tactics and attack Texas trans kids. The Texas GOP House decided to attach an anti-trans amendment to SB 2078, which was supposed to be focused on Texas school districts 'multihazard emergency operations plans' and by a 91-50 party line vote amended it to require transgender students to use a single stall restroom, locker room, and changing facility at their school if they didn't want to use one based on their birth gender. 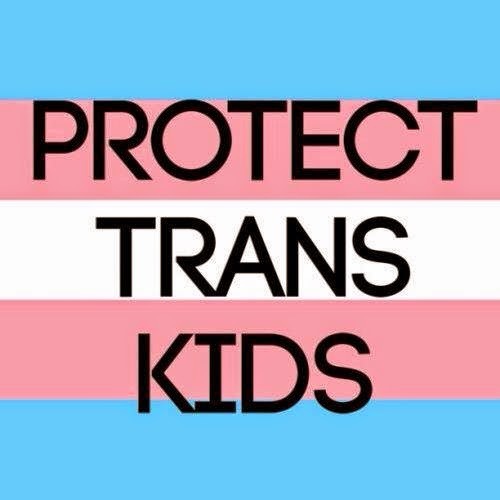 The amended bill then passed a 92-49 second reading vote as trans kids and their parents observed the unjust proceedings from the House gallery. 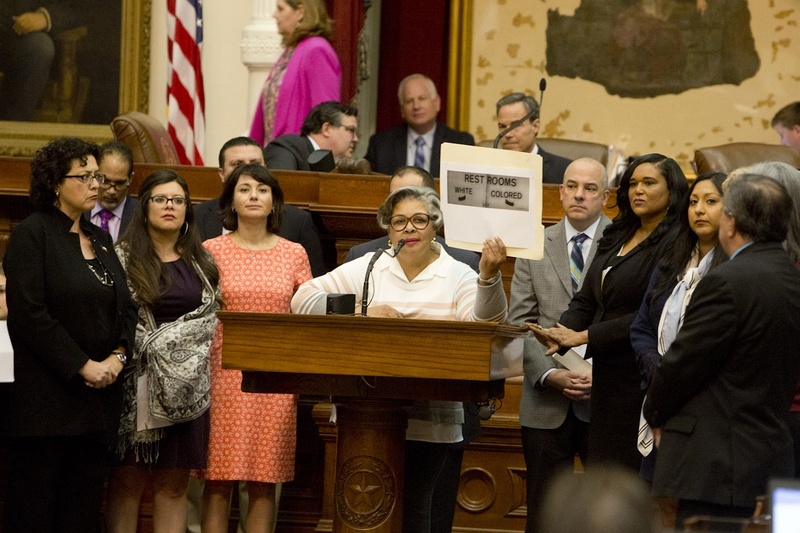 The Texas Democrats put up a fight, with Rep Senfronia Thomson (D-Houston) pointing out along with other Dems during a tense House floor debate that this was nothing more than a replay of Jim Crow era segregation as the Republicans tried to pathetically claim it wasn't meant to target transgender students. 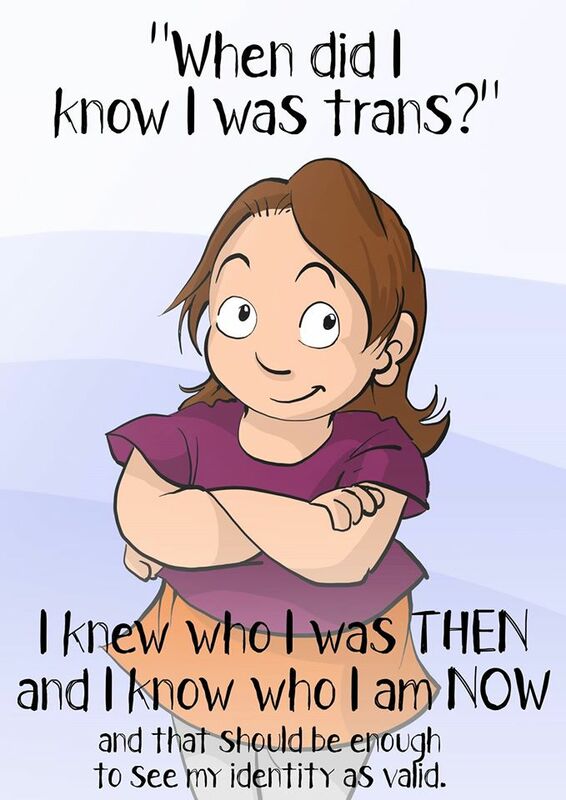 I've loved the online webcomic Assigned Male ever since I stumbled across it during one of my web searching forays for interesting things to write about. I wrote about its importance to our community, and even had the pleasure of meeting its lovely artist Sophie Labelle in the vendors area during last year's Philadelphia Trans Health Conference. But what I'm not happy to hear is that haters have been sending Labelle death threats, doxxed her and hackers in a coordinated attack were successful in temporarily taking down her Facebook website with over three years of Assigned Male strips on it. Fortunately she'd backed up her work and the Facebook site is now back up online, but it forced her to cancel a book tour appearance in Halifax. Labelle's book is entitled Dating Tips For Trans and Queer Weirdos, and is a 28 page one that explores the relationship between Ciel and Eirikur, two of the Assigned Male comic characters. The book tour has two more stops in Quebec City on May 25 and Vancouver on June 1. Labelle says in a Toronto Star interview that she is more determined than ever to not let the haters win and give it the best she's got. That's wonderful to hear because the comic stip is important to our trans kids. They need to see positive representations of themselves in the comic world, and I agree with Sophie, that's one of the reasons why the haters came after your strip. But it's nice to know that your book tour will not only continue, but we'll see more of the Assigned Male adventures of Stephanie and her friends. . The New H-Town Emancipation Avenue Signs Are Up! Thank You For A Fab 55th Birthday!